Mass A (1.0 kg) slides across a frictionless surface with a velocity of 8 m/s in the positive direction. Mass B (3.0 kg) is initially at rest. The two objects collide and stick together. 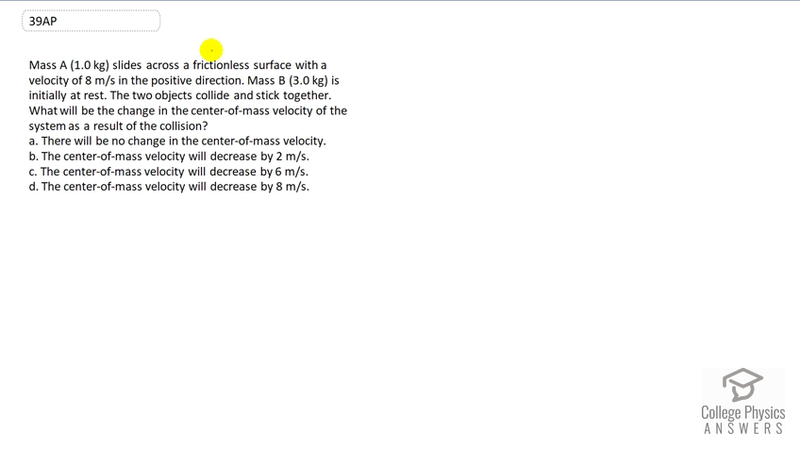 What will be the change in the center-of-mass velocity of the system as a result of the collision? There will be no change in the center-of-mass velocity. The center-of-mass velocity will decrease by 2 m/s. The center-of-mass velocity will decrease by 6 m/s. The center-of-mass velocity will decrease by 8 m/s. This is College Physics Answers with Shaun Dychko. Since these masses are sliding across a frictionless surface, the system is isolated and there is no net external force being applied on the system. Because of that, there can be no change in the velocity of the center of mass. There has to be an external net force in order for anything to change with the center of mass and so the answer to this is A.